Fantasy may still be going strong, but has science fiction's moment to shine finally come? On Monday, we dissected the recent and upcoming slate of fantasy movies that have generated some of Hollywood's big bucks over the past decade. With most of the big franchises having ended and/or peaked for now, fantasy has some competition from its younger, sometimes more ostracized sibling: science fiction. 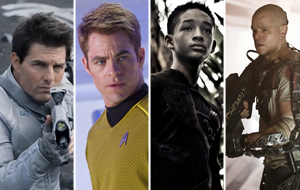 While many fans of the two genres crossover, 2013 is poised to showcase the financial potential of sci-fi better than ever before. We can pinpoint sci-fi's current era of ascension in 2009. No, not just with Avatar--but that's playing an influential role of its own. Rather, until May of that year it was nigh unfathomable (outside of the film's creators) that a Star Trek movie could ever be a blockbuster player at the box office. J.J. Abrams' reboot of the franchise became exactly that, excelling in a creative arena where some critics feel that the Star Wars prequels (a hybrid of fantasy and sci-fi themselves) didn't between 1999 and 2005. Later in the summer of 2009, director Neil Blomkamp and producer Peter Jackson further broke the mold with District 9. That R-rated sci-fi flick became one of the biggest sleeper hits in recent memory despite its fairly esoteric subject matter that probably would have doomed it to "development hell"--or, at best, direct-to-video life--in the 1980s and 90s. James Cameron then returned to the genre he helped shape with Aliens and the Terminator franchise by delivering the biggest earner in box office history. Again. As the movie that ignited the 3D craze and sparked the next step in CG effects, Avatar's success speaks for itself. The last couple of years have been more quiet on the sci-fi front other than last year's Prometheus, a modest domestic performer with slightly stronger overseas results. But 2013 is set to bring the genre back in a huge way. Sci-fi's most prominent box office presence in recent memory will start with director Andrew Niccol's (In Time, Gattaca) adaptation of The Host. That movie drops on March 29. If author Stephanie Meyer's Twilight fans show up, it could be a sleeper to watch out for. Next up will be Tom Cruise's and director Joseph Kosinski's (Tron: Legacy) Oblivion on April 19. Releasing so close to the big May blockbusters could work against it in the long run, but if the film delivers in combination with the early marketing campaign, the stage will be set for an early start to summer. Online buzz is already solid for the film. The next one on the slate is more of a sure thing: Star Trek Into Darkness. Not only did Abrams revive a fan's franchise into something made for everyone four years ago, in May he will deliver one of the most buzzed about movies of the year. This one may be even more anticipated than the last, which began convincing the uninitiated weeks before release thanks to an incredible marketing campaign and early screening word-of-mouth. Of all the sci-fi films this year, Into Darkness probably has the biggest box office potential. Again, say that ten years ago about a Trek movie and you'd be hauled off to the loony bin. In June, M. Night Shyamalan takes a crack at the genre with After Earth. Sure, it may be arguable that he already dabbled in sci-fi with Signs, but After Earth appears more rooted in the "traditional" image of the genre. Oh, and the movie stars Will and Jaden Smith. It will be hard for audiences to ignore a movie with names like that, and don't forget about the elder Smith's past successes in the genre (Independence Day, Men In Black, I Am Legend). Two months later, Neil Blomkamp finally delivers his second directorial effort with Elysium. Little is known about the next original film from the writer/director other than its futuristic setting where the wealthy live on a space station orbiting an apocalyptic Earth, but it stars Matt Damon and Jodie Foster. Combining the goodwill from Blomkamp's last film with audience-friendly stars could make this another August breakout in the same vein as District 9 itself. October then sees the release of Alfonso Cuaron's Gravity. A bit more grounded in "modern day" science fiction, the film stars George Clooney and Sandra Bullock--two actors with enough popularity that the appeal of their teaming could be greater than the sum of its parts. Admittedly, though, Cuaron's Children of Men wasn't a major box office success despite incredible reviews and its place on many film fans' lists of favorites from the past decade. Finally, in November, the adaptation of a popular 1985 Orson Scott Card novel, Ender's Game, will kick off the holiday movie season. The movie stars Harrison Ford, Asa Butterfield, Abigail Breslin, Hailee Steinfeld and Ben Kingsley. Gavin Hood (Tsotsi, Rendition, X-Men Origins: Wolverine) directs. That's seven--count 'em, seven high profile sci-fi movies hitting theaters this year. Mind you, we're not even counting the hybrid-genre titles like The Hunger Games: Catching Fire or Pacific Rim. Compare that to the major fantasy movies of 2013: Jack the Giant Slayer, Oz: The Great and Powerful, possibly Percy Jackson: Sea of Monsters and Mortal Instruments and, of course, The Hobbit: The Desolation of Smaug. While those first two carry some recognizable names and traits, its easy to argue that most of the year's upcoming sci-fi offerings may have just as much potential for success (if not more). That could make the box office runs between these films and their related genres very competitive. Additionally, consider the fact that The Hobbit, while strong out of the gate with its first entry, didn't reach the attendance levels of its Rings predecessors. There's no questioning the trilogy's inevitable financial success, and in general, the first film seems to be a hit among many fans. Remember this, however: in 2002, The Two Towers grossed in less than three days what it took Star Trek: Nemesis to make during its entire domestic run. Flash forward to today. The performances of 2009's Star Trek and 2012's The Hobbit: An Unexpected Journey suggest that general audiences aren't showing as much prejudice between the two franchises--or by extension, the fantasy and sci-fi labels--as they used to. For now, it's still a very good time to be a fantasy fan and that genre will always be around in some form. But if you've been holding out for the "sci-fi invasion", then 2013 is your year. From comic book adaptations to fantasy and science fiction, geeks don't just rule the world anymore--they rule the box office too. http://www.specializebusiness.com	Many individuals have grown to be very successful operational and have grown to be very rich because of the businesses. Several individuals have discovered fame in the commercial community as well as their achievement stories tend to be no secret towards the public. http://www.technologyforreal.com	It is actually apparent that to be able to survive as well as thrive within the real house industry these days, real auctions and real estate agents must accept every area of technology as well as remain along with the have to continually update their techniques.